Life is meant to be lived outside! We spend so much time outside during the summer, and having a great looking lawn and pretty gardens makes sure that time will be far more pleasurable. These summer garden tips will ensure that you have an endless supply of color and lush green lawns all summer long. Bring on summer! Thank you TruGreen for sponsoring this post. My gardens are the big love of my life this time of the year. I spend hours outside tending them. I have 10 garden beds on a block that is about 1/2 acre and I do things to improve the look of them each year. I’ve planted, moved, divided and tended for years to get them to the state that really pleases me now. 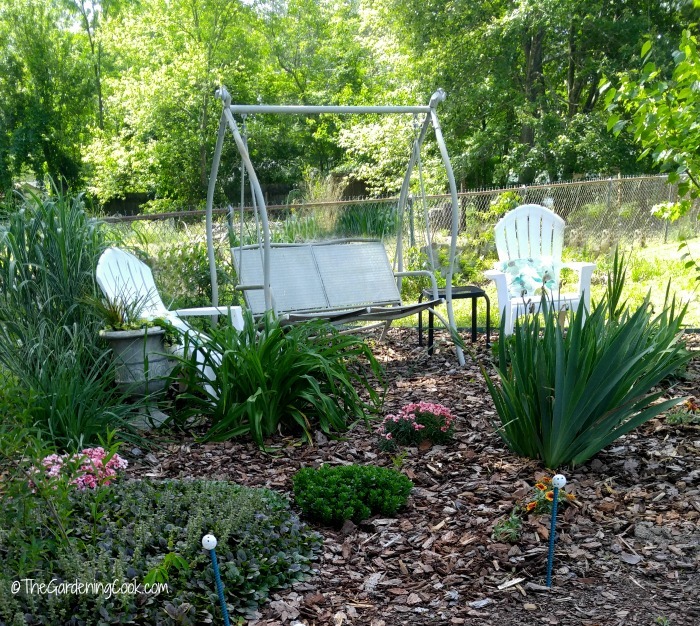 I am delighted to share some photos of my summer garden, plus tips that I’ve used to improve the garden beds year by year. 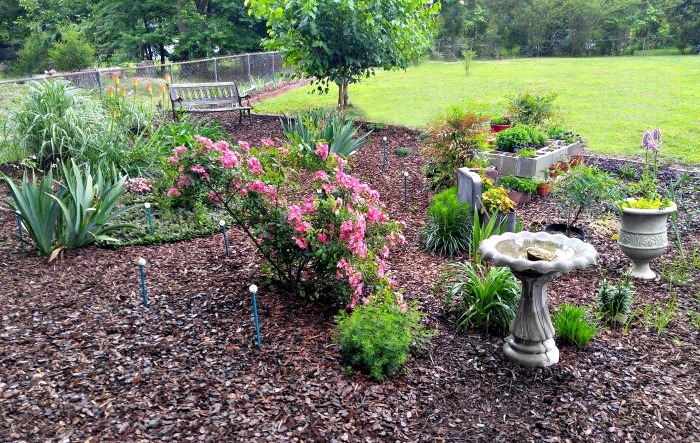 These tips may help you get the garden of your dreams, too! Plant both Early Spring and Summer Bulbs, especially those that re-bloom. I have lots of early spring bulbs such as tulips, hyacinths and daffodils which give me very early spring color, but when they finish flowering that is not the end of the color. My main front garden bed has a lovely ground cover called Ice plant which is ablaze with color all summer long. Gardenias, gladioli, liatris and re-blooming daylilies give more color as their all get their turn in the sun. The key to making sure that re-blooming bulbs do actually bloom again is to remove the spent flower stalks after the first go round of flowers. 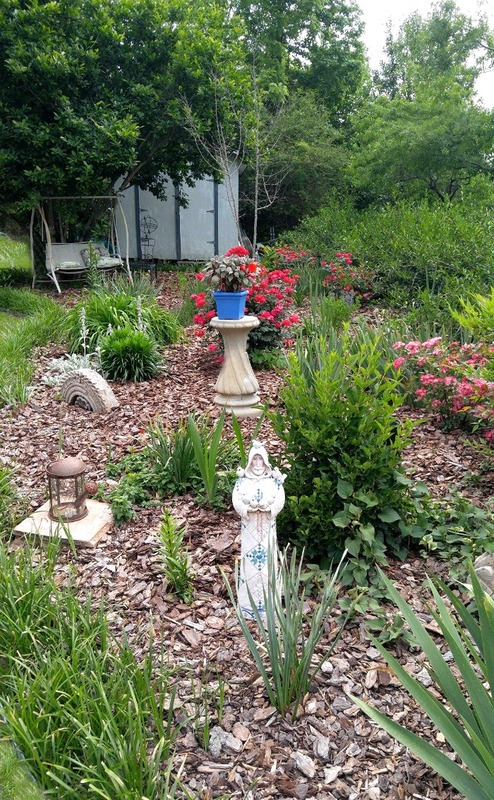 After the splendor that comes from early spring bulbs and the yellow blaze of my forsythia, a summer garden bed can look pretty ragged if you don’t ensure that you have something to take over. Summer blooming perennials do that job nicely. Lambs ears, daylilies, roses, baptisia and canna lilies fill up a semi sunny bed which is the main garden bed visible from our deck and it gives us color all summer long. Be sure to deadhead flowers to encourage more blossoms. Roses keep me busy all summer long. I have dozens of large rose bushes that are covered with flowers right now. But if I neglect them, they won’t be beautiful for long. Dead-heading removes spent blooms and encourages the plant to fill out for more flowers soon. 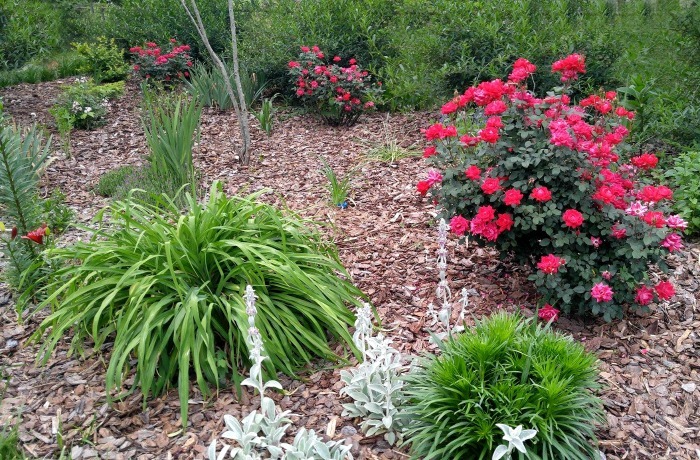 If you hate this job, be sure to check out these plants that don’t need deadheading. Watering is the morning is most efficient. 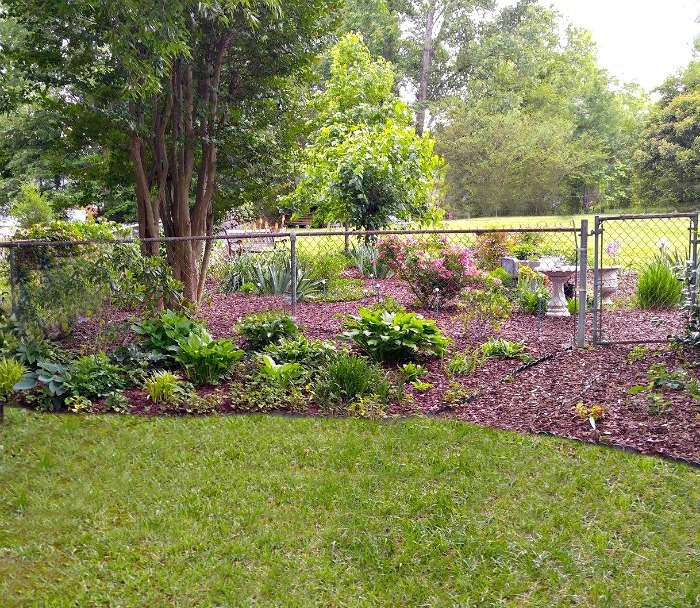 My southern garden bed has been the hardest of all my garden beds to get to the stage where I like the way it looks. It gets hours and hours of direct southern sunlight daily. and needs lots of water to keep it looking good. Watering early in the morning prevents mildew and allows me to get the most out of the water that the garden bed gets. 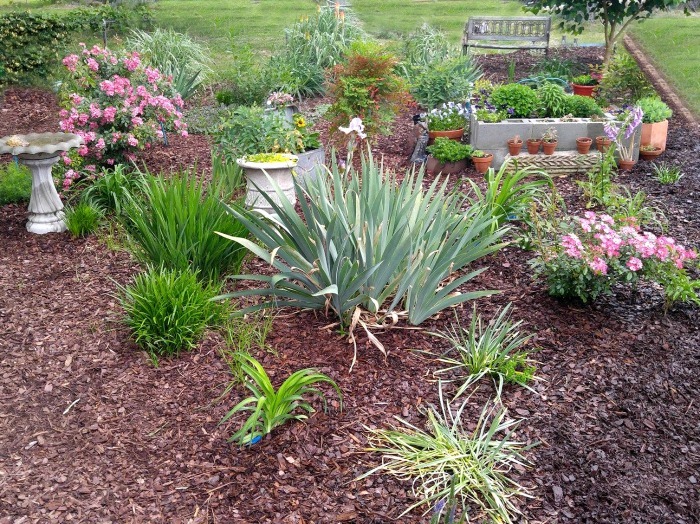 Planting heat resistant and sun loving plants in this garden bed is important. I have finally have discovered the right mix of plants for this south facing bed. Roses, daylilies, red hot pokers, black eyed Susan, foxgloves and other sun loving plants are perfect for keeping this big bed in full bloom. 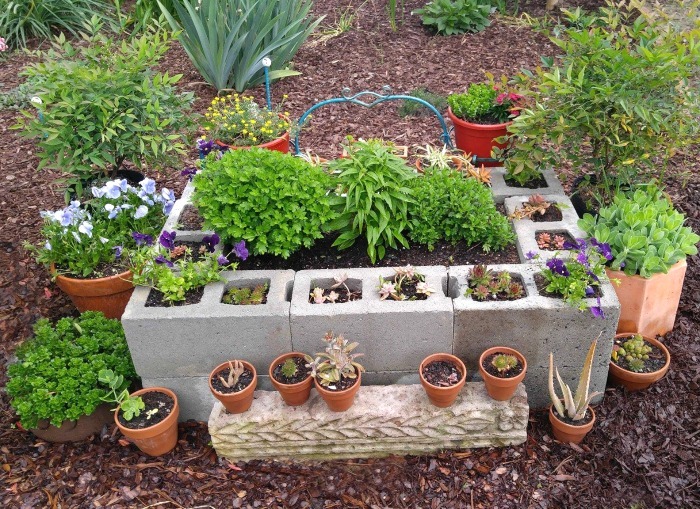 A raised garden bed that I made out of cement blocks houses all of my succulents as well as annuals that get changed out as the summer progresses. It makes a great focal point to the entire bed. The positioning of plants matters a great deal. It doesn’t matter how much you might love hostas if all of your summer garden beds get full summer sun. They just won’t do well. Consider where you will plant before you purchase. 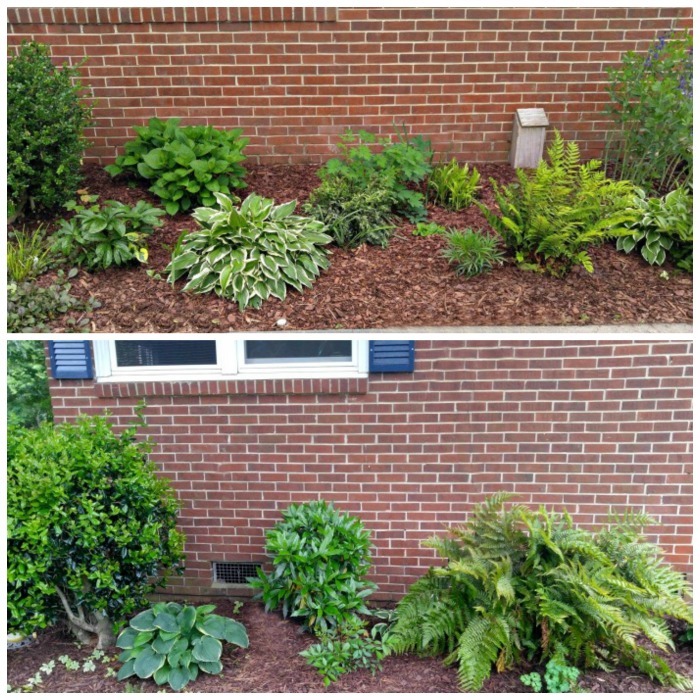 Hostas and many other plants LOVE shade. I have four garden beds that will allow me to plant this type of plant with great success. Two are on the east facing side of my house under the shade of a large pin oak tree. Elephant ears, hostas and heucheras grow beautifully here. The pretty shade border on this side of the fence has another garden bed just on the other side of the divider that gets the most sun, but both need very different plants in them. And two other shady borders are on the north facing side of my house. 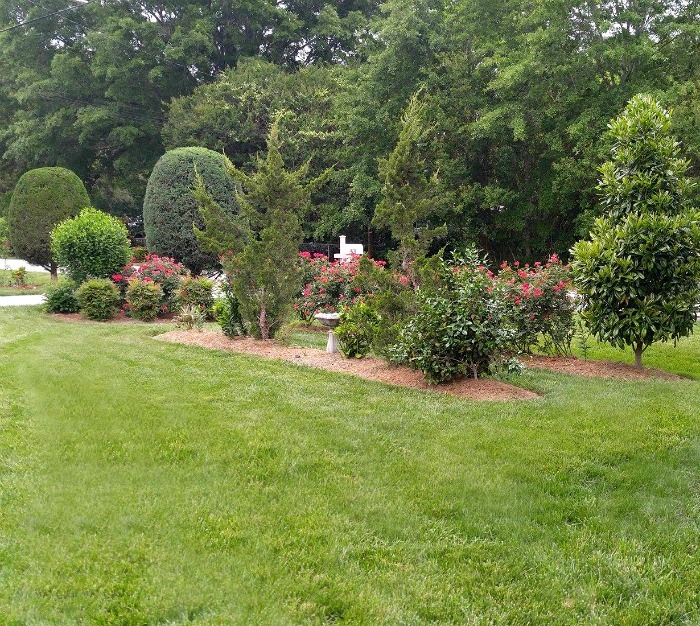 Ferns, hydrangeas, bleeding heart, and other plants grow beautifully in these beds. 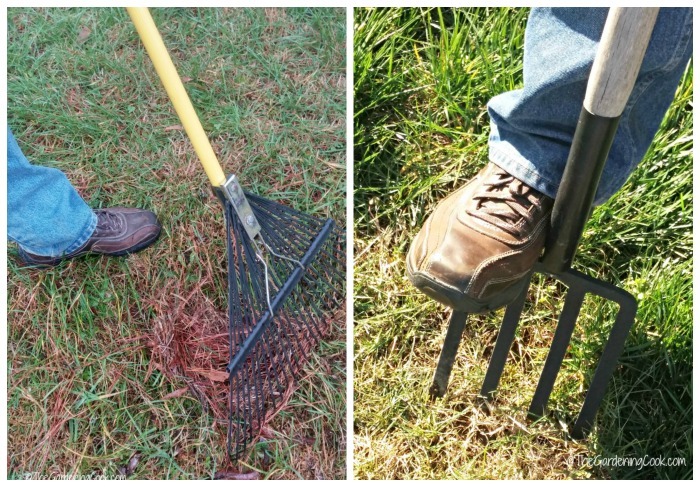 Follow these tips for lush green lawns. A new survey conducted by Harris Poll on behalf of TruGreen shows that Americans spend an average of 12 hours outside in their yards during the summer months. A big part of that time can be spent tending lawns to make them look better. Are some of your favorite memories those that come from time spent outdoors with your family? If they are, having a healthy and lush green lawn is probably important to you. If your lawn is not in the best shape, here are a few things that you can do to help make your lawn be the pride of your neighborhood. Raking and aerating lawns Doing this early in the spring will go a long way towards giving you the lush green lawn that everyone wants. These two tasks ensure that the debris and thatch from the winter is removed and allows light and air to hit the soil to encourage good growth. Watch the height of the mower bed. Be careful about how low you mow your lawn. Dry, brown weed infested lawns can be the result of cutting lawns too low. 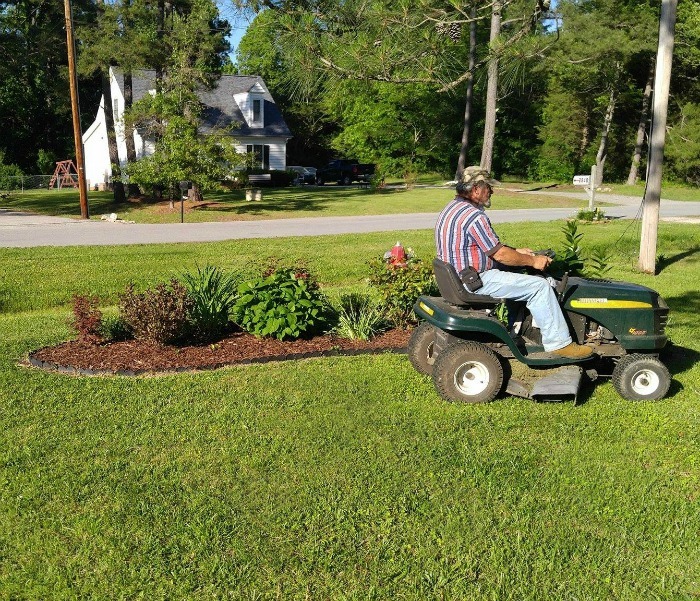 My husband has the bed on our mower lower early in the summer but always raises it as the hot days start to roll around, and our lawns thank him for it. Edge your borders. Well tended lawns need edges that are nicely trimmed to look good. There are many edging methods. For most of my beds, I use a combination of plastic edging or bricks, so that my husband can use his edger to trim right up to the bed. Edging with plants works well, too, as does digging a trench around the garden bed to keep weeds away. 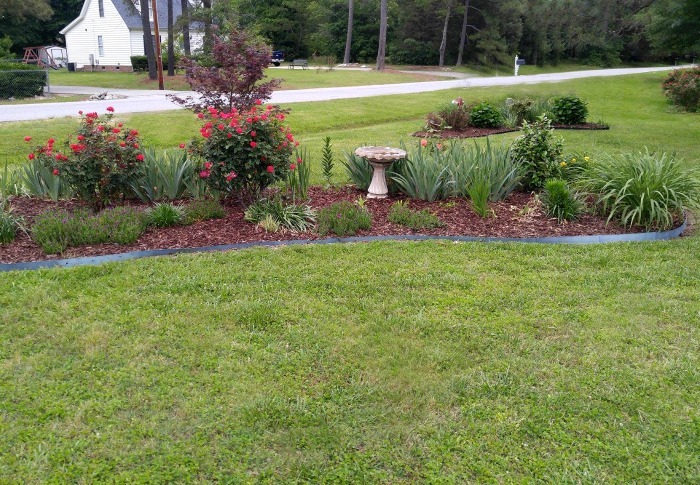 I have one garden bed that has the entire outside of it lined with liriope. This grass flowers in the mid summer and adds a finished look to the whole garden bed. Bring in the professionals for extra help and advice. Keeping lawns and a summer garden in good condition is a big job. Consider a professional to help take care of your lawn for you. TruGreen is a Memphis, Tennessee based company that specializes in lawn care. It serves more than 2.3 million residential and commercial customers across the United States to help keep their lawns, trees and shrubs looking great. If you don’t have the time to take care of your lawn and gardens, give them a call. 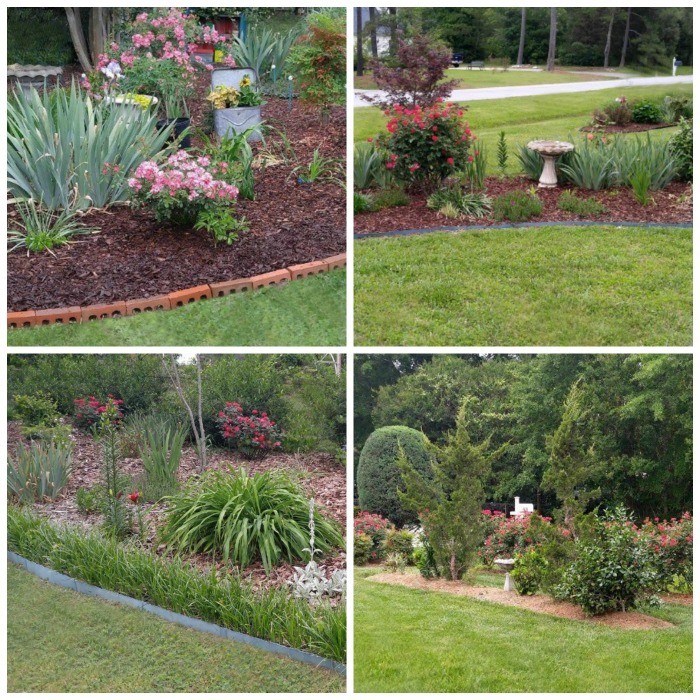 Their professionals will have your gardens looking great in no time at all. Mulch makes the job of weeding much easier. We all hate weeding but it is a task that has to be kept on top of. I tackle the biggest part of the weeding job in early spring when it is cool, and then make sure that I have several inches of mulch in place. This makes the weeding job easier in the summer when the temperatures are hotter and the weeds are growing. Landscape cloth and cardboard between the plants and under the mulch also does a good job of keeping the weeds under control. Seating Areas add a Great Deal of Interest. I have seating areas in several of my larger beds that I enjoy in my summer garden. They look great and are a wonderful place to read and admire the fruits of my labor. I try to position them under the shade of large trees if I can to ensure that there is shade when the temperatures heat up. 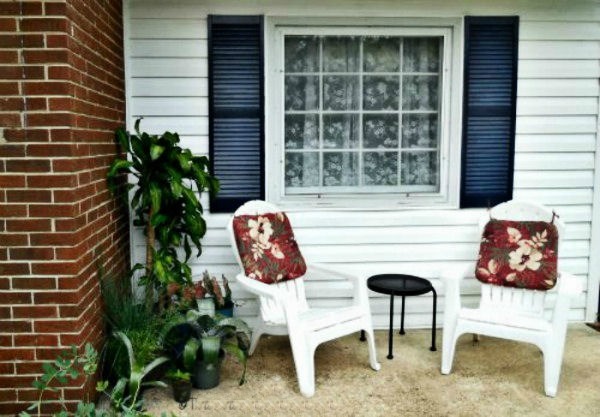 My husband and I love to catch up at the end of the day in one of these pretty seating areas. 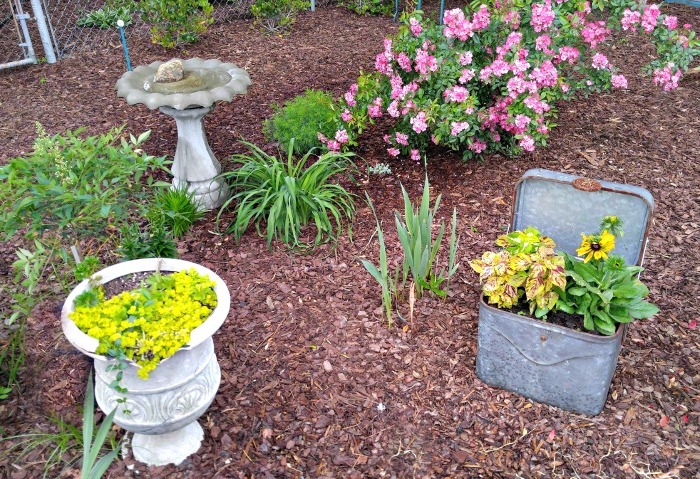 They add so much charm to a garden bed. Keep Pots Cool by positioning them on shady patios. I have lots of potted plants, but they can get really overheated easily. Terracotta pots in particular attract the heat. Light mulching helps but the best trick is to keep them out of the direct sunshine. I have a front patio where I keep a lot of my indoor plants. They face the north and don’t dry out as often as those on my patio and they stay healthy and lush all summer. I use this area for my indoor plants that I bring outside for the summer months. The key to a great looking summer garden really is early preparation. Planning ahead makes sure the hardest jobs are done early to allow you to spend you time enjoying the fruits of your labor. Summer is the time for BBQs, outdoor parties with badminton games on a lush green lawn, and enjoying summer entertaining with friends. Will your gardens be in good shape for the summer activities? Put my tips in place and you, too, can have the garden of your dreams. I hope you have enjoyed my garden tour. I’d love to see some photos of your gardens uploaded to the comments below! For more information on TruGreen, visit them on Facebook, Twitter, Pinterest or Instagram.